(Phys.org)—A team of researchers with the University of Vienna in Austria and Delft University of Technology in the Netherlands has developed a technique using photons for controlling and measuring phonons. In their paper published in the journal Science, the team describes their technique and suggest that their work might have laid the groundwork toward a method to store information in a quantum computer. Phonons are waves of particles moving together through a material—like ocean waves, they propagate, leaving the particles through which they move in their original state. Prior research has shown that phonons have some behavioral characteristics that resemble particles, which is why they have been labeled quasiparticles, and also why they have been of interest in so much recent research. Scientists are interested in phonons because they may provide a bridge between the classical world and the quantum world. In this new effort, the researchers have developed a way not only to measure phonons as they propagate, but show that it is possible to control them, as well. The technique involved firing a blue pulse of light at what they describe as a microfabricated silicon nanobeam—a form of optomechanical crystal. It was designed to vibrate in particular ways when hit by a photon. As the blue light struck the device, it created phonons. They next fired a red pulse of light at the phonons to induce a state-swap interaction. Those photons were then reflected back to a photon detector and were subsequently analyzed using Hanbury Brown and Twiss interferometry. 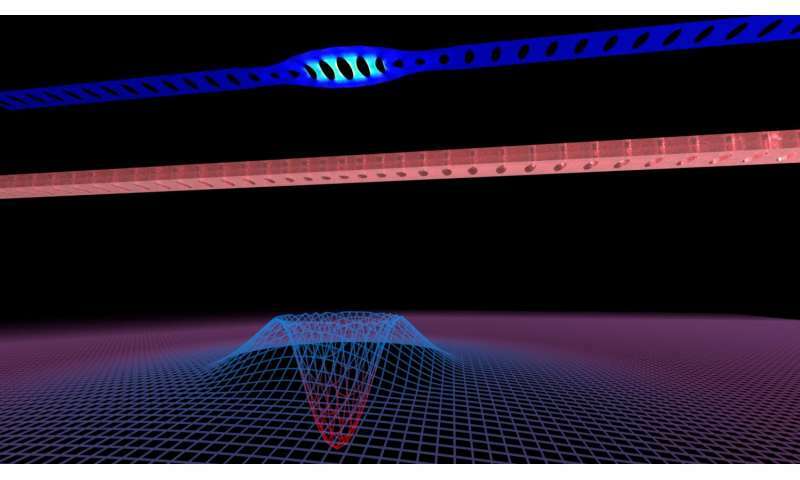 The researchers used the state of the photons to determine the non-classical state of the phonons in the device. The team showed that individual phonons moving in a crystal follow the laws of quantum mechanics as opposed to classical physics. The researchers point out that because of its quantum properties and the use of light, the technique offers a possible path toward using phonons as a means for storing quantum information of the type that could be needed in a quantum computer. Nano- and micromechanical devices have become a focus of attention as new solid-state quantum devices. Reliably generating non-classical states of their motion is of interest both for addressing fundamental questions about macroscopic quantum phenomena as well as for developing quantum technologies in the domains of sensing and transduction. We use quantum optical control techniques to conditionally generate single-phonon Fock states of a nanomechanical resonator. We perform a Hanbury Brown and Twiss type experiment that verifies the non-classical nature of the phonon state without requiring full state reconstruction. Our result establishes purely optical quantum control of a mechanical oscillator at the single phonon level. "The team showed that individual phonons moving in a crystal follow the laws of quantum mechanics as opposed to classical physics." Whaaa!? I'm a physics reader not a physicist, but isn't that supposed to be against the rules? Isn't classicality supposed to emerge from QM not the other way around? And is the process reversible? Can they get photons from photons? Prior research has shown that phonons have some behavioral characteristics that resemble particles, which is why they have been labeled quasiparticles, and also why they have been of interest in so much recent research. Scientists are interested in phonons because they may provide a bridge between the classical world and the quantum world. The quantum nature of phonons was never seriously in question. They are no more a bridge to between the quantum and classical world than photons, although experiments demonstrating their quantum nature have never been as numerous as for photons. The article certainly does not provide insight into how the " bridge between the classical and the quantum world" will be elucidated. Yeah, I did some research after reading this and saw the knowledge goes way back. But as a reader of this stuff rather than an actual physicist, I had a strong sense quantum behavior was very isolated to things like photons. To see it manifesting in all these different mediums is pretty surprising to me.